This is the next book that I've read for the Lay Worship Leader course that I am taking. 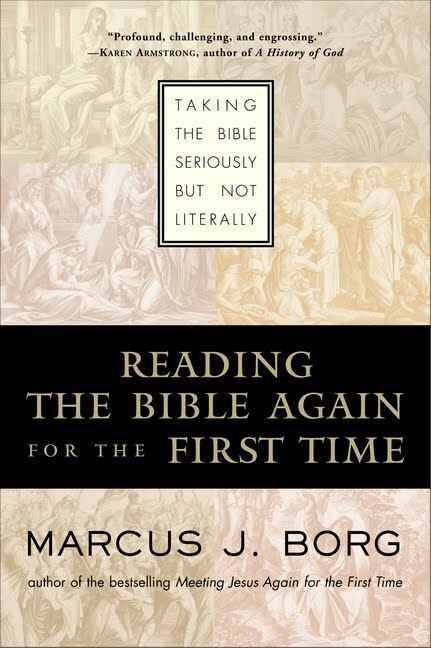 The lens through which to read the Bible presented in this book is a metaphorical reading, which made perfect sense to me. After all, Jesus taught in parables, which are essentially metaphors. As the author states early in the book, "metaphors can be profoundly true, even through they are not literally true. Metaphor is poetry plus, not factuality minus. That is, metaphor is not less than fact, but more. Some things are best expressed in metaphorical language; others can be expressed only in metaphorical language." I really appreciated the author's clarity of thought and language in this book. What disappointed me was that in trying to cover the whole Bible in 300 pages, some things were bound to get left behind (pun partially intended for anyone who gets it!). There is a whole chapter dedicated to the first 2 chapters of Genesis; and another chapter to Revelation. And yet the 4 gospels are crammed into one chapter; the prophets (another 21 books of the Bible) are given another chapter; and several books (e.g. Psalms, the non-Pauline epistles) are skipped over completely. I guess I have unrealistic expectations - if as much attention was given to the whole Bible as was given to the first 2 chapters of Genesis, the book would have been too long for all but the most dedicated readers! But still, I felt cheated. But don't get me wrong - overall, I did like this book, and agreed with most of what was in it. There was particular attention paid to the themes of social justice that run through the Bible as a whole; and anyone who knows me (or is a regular reader of this blog) will know that social justice is something that I am passionate about. To quote the author in the epilogue of this book, "(t)he God of the Bible is full of compassion and passionate about justice." I have always enjoyed reading the Prophets, and this book helped me realize why. It also made me long for prophets in our own time - people equally passionate for God and for social justice; and who are willing to break with convention to get their message across. I figure that I'm on track with my required reading, with one book left to read before the next session at the end of March. I'm going to take another fiction break now, and get through some titles on my "for fun" TBR list. I've booked a week off work in February, and am planning a "stay-cation" with nothing but books, music, and the gym in my schedule! I read Borg's Meeting Jesus Again for the First Time and had a lot of complicated feelings about the subject matter. But I thought Borg seemed passionate about his subject and knowledgeable about it, too. So I'd like to give this one a go, sometime, too. Cath - I seem to recall your mixed feelings around religion from LuLu's baptism (cute baby you have, BTW!). This was my first experience with Borg, and I agree with you that he seems both passionate and knowledgeable about his subject. I probably wouldn't have gravitated towards this book if it hadn't been "required reading" for this course - I consider myself to be a Liberal Christian, but I find this type of book to be a bit predictable in it's message and I prefer to be challenged a bit more in my reading. A couple of books that I read last year that I would very highly recommend are Compassion and Solidarity by Gregory Baum and Drawn into the Mystery of Jesus through the Gospel of John by Jean Vanier. I've linked to my reviews of both of those books. Thank you so much for the recommendations (and the kind words about my cute, germy girl)! I have mixed feelings about religion, yes, but I still love reading about it and other peoples' take on it. So I am excited to check these out. Your Lay Worship course sounds wonderful and like a chance to do some valuable reading/thinking/learning...I am enjoying your recaps of the books you're reading for it. Please keep it up! Cath - The reading list was one of the things that drew me to this LWL course (that, and the fact that I have sometimes lead worship services at my church and wanted to get more comfortable in the role). Don't worry - the course is 2 years long, and there are 16 books to be read (10 required and 6 electives). I have been submitting formal "reading responses" and using this blog for ramblings that don't really fit into the formal response!